We’d love your help. Let us know what’s wrong with this preview of Bridges Burned by Annette Dashofy. Agatha Award Nominee for Best Contemporary Novel of 2015! Paramedic Zoe Chambers is used to saving lives, but when she stops a man from running into a raging inferno in a futile attempt to rescue his wife, Zoe finds herself drawn to him, and even more so to his ten-year-old daughter. She invites them both to live at the farm while the grieving widower picks up the pieces of Agatha Award Nominee for Best Contemporary Novel of 2015! To ask other readers questions about Bridges Burned, please sign up. Will there be more books in this series after "Bridges Burned"? Annette Dashofy YES! I am finishing the 4th in the series, With A Vengeance right now, and I'm contracted through SIX in the series! It all starts with an explosion. One of the few houses in a new subdivision explodes after the residents report smelling gas. While EMT Zoe Chambers isn’t on duty, she rushes to the scene to offer whatever aid she can. While she is there, she stops the distraught owner from rushing in to see if his wife was home. Sadly, the wife’s remains are found in the rubble. The fire investigator also find evidence that the gas leak and explosion that killed her wasn’t an accident. While police chief Pete A It all starts with an explosion. One of the few houses in a new subdivision explodes after the residents report smelling gas. While EMT Zoe Chambers isn’t on duty, she rushes to the scene to offer whatever aid she can. While she is there, she stops the distraught owner from rushing in to see if his wife was home. Sadly, the wife’s remains are found in the rubble. The fire investigator also find evidence that the gas leak and explosion that killed her wasn’t an accident. While police chief Pete Adams, Zoe’s new boyfriend, immediately suspects the husband of setting things up, Zoe doesn’t believe it. It helps that she has begun bonding with the victim’s daughter. Both Pete and Zoe dig in their heels, certain that they are correct. Where will the facts lead? Will their relationship be destroyed before the truth is revealed? With Zoe and Pete’s relationship being fairly new, this mystery really tests them. As always, both are prominent characters, even sharing time as our third person view point characters. That’s a good thing, too, since it allows us to better understand where they are coming from in their arguments and lets us see they both know when they might be wrong or did something stupid. But all this drama is only part of the book. While this might be a bit more of a procedural than the multiple suspect books I am used to reading, we still get plenty of twists and turns to the case and a climax that had me turning pages as fast as I could to see what would happen next. Obviously, Zoe and Pete are strong leads, but the rest of the cast are just as strong. Like the rest of the series, this book straddles the line between traditional and cozy with just a smattering of foul language and a bit more detail than in the books I normally read. Just know that going in, and you’ll be fine. Last year I had the great pleasure of experiencing my first novel by Annette Dashofy - Lost Legacy, the second book in the Zoe Chambers Mystery series (yes I started on Book 2!!) which was one of my five star reads of 2014. I was really thrilled to see the third book in the series appear on my reading radar and as soon as it magically downloaded to my Kindle (seriously it never gets old, the pressing of the download button and seconds later "BAM" it is there ready to go!!) I got myself nice and comfy and found myself deeply involved in another mystery for Zoe. A fire has broken out at a local housing development, when the responders turn up they are glad to find out that the house is no longer occupied but that feeling doesn't last for long as a distressed man tries to run in to the house, the reason - his wife is in there. Pete Adams, the local police chief and Zoe's love interest sets about finding out what has happened, the discovery of a body in the house confirms that the man was unfortunately right his wife was indeed in the house, the man is Holt Farabee and the fire is another addition to his run of terrible luck, it is discovered that the Farabee's should not have been in the house in the first place, having defaulted on their mortgage they have been illegally squatting inside the house. Farabee and his young daughter are understandably devastated and when it turns out that the fire may have been set deliberately Pete starts looking very closely in to Farabee and his past. Zoe in the meantime has problems of her own, a land developer has been sniffing around the farm and with the buildings costing more and more she fears that the home she loves may be taken from her plus her fledgling relationship with Pete is not quite getting of the ground. Being the caring type Zoe offers Holt and his daughter a place to live in exchange for getting some work done about the farm, Pete needless to say in not pleased, he fears that Holt has had something to hide and it probably has to do with the death of his wife, because of this Pete and Zoe's relationship becomes strained. Now as the story continues we meet other characters such as the family with a dispute over hedges (now it may not sound exciting but trust me it is very important) and the land developer who wants to buy the farm, little by little their stories become weaved together and this is what makes this book so good, you begin to believe that one character is the bad guy only to have another thrown in to the mix leading you down a different road. Bridges Burned is great novel, it has plenty of twists and turns, intrigue, romance and humour. The characters are really well written and most importantly they are likeable. Annette does a great job of bringing everything to life and like all good series it is a pleasure to come back to it. Zoe is a paramedic and stops a man rushing into a burning building to try to rescue his wife. She then offers him a home at her farm with his daughter. The Police chief, Pete, is concerned about this as he suspects him of setting the fire to kill his wife. Lots of twists and turns where we consider who is right and whether Zoe could have put herself in danger. It puts a strain on their fledgling relationship- is he jealous? This was part of a series I hadn’t read before- but I’m now keen to read m Zoe is a paramedic and stops a man rushing into a burning building to try to rescue his wife. She then offers him a home at her farm with his daughter. This was part of a series I hadn’t read before- but I’m now keen to read more by this author. With many thanks to the publisher and Net Galley for a copy of this book. 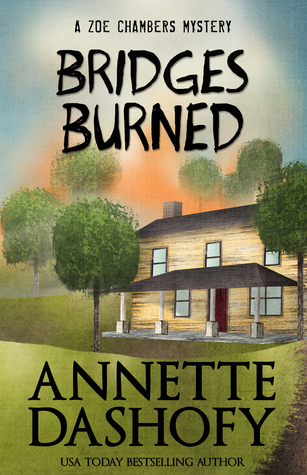 Bridges Burned is the third book in Annette Dashofy's Zoe Chambers mystery series. It's an intensely suspenseful read and, I think, my favorite of the series to date. I so admire how Annette Dashofy brings her characters to life. She really gives each character a unique voice and that little detail is a huge reason why I so enjoy her writing and this series. This book was a nail-biter, for sure! Zoe and Pete, friends and colleagues for some time, are navigating the waters of moving their friendsh Bridges Burned is the third book in Annette Dashofy's Zoe Chambers mystery series. It's an intensely suspenseful read and, I think, my favorite of the series to date. I so admire how Annette Dashofy brings her characters to life. She really gives each character a unique voice and that little detail is a huge reason why I so enjoy her writing and this series. This book was a nail-biter, for sure! Zoe and Pete, friends and colleagues for some time, are navigating the waters of moving their friendship into a more romantic zone, but it certainly isn't going smoothly. Just as their romantic relationship is trying to find its feet, a fire breaks out--the results of which drive a wedge between Zoe and Pete. The tense moments between the pair are full of missteps and mis-communication and I worried constantly that their romance would be over before it ever really began. I also found myself talking to this book as I read. Honestly, it was like watching a scary movie when you shout at the screen that the killer is right behind that door! Don't go in there! I had been harboring feelings of suspicion for one of the characters right from the start and, as it turns out, my suspicions were well-founded! As the evidence that Zoe and Pete uncover along the course of the story emerged, I was more and more sure of my feelings about who the villain was - and I was trying my best to tell Zoe and Pete. But, alas, neither character listened to me until it was almost too late. Bridges Burned is an engaging story full of intense and hypnotically suspenseful plot twists. I was engrossed in the story from the beginning and I'm really looking forward to what comes next. I feel that the story ended at just the right point--enough had been resolved and yet there are big threads left dangling, as well. Stay tuned! I know I sure will be! I absolutely love Annette Dashofy's Zoe Chamber's Mystery series. It is set in a fictional county in PA that's near Pittsburgh. Mind you, when I started this series, it kind of through me, because I'm from the area and I knew there wasn't a Monongahela County. In this book Zoe rescues a man from running into a burning building, only to find out his wife was in the house. The fire was caused by a natural gas explosion and Zoe finds herself getting a little close with the victim's family. I had I absolutely love Annette Dashofy's Zoe Chamber's Mystery series. I had only one gripe with the story and that dealt with the foreclosure process. Being in the market for a house and finding all the houses I like are in foreclosure, I know that because of PA law, this house wouldnt' have been going up for sheriff sale that quickly. Foreclosures take forever. But I'll ignore that, because I love the story and because it played a part in the crime. Holt Farrabee is the main suspect, but he is way too likable and his daughter is a fabulous character. I loved these two. You really connected with them and so did Zoe. Usually, I can't figure out the whodunit, but for some reason with this book, I knew from the moment the character appeared, that he was the killer. I think that might be me though. Annette really keep you on the edge of your seat with Zoe and Pete's relationship. These two really belong together and let's just say that things were very touch and go throughout this book. Good third in the Zoe Chambers series.Things get complicated between Zoe and Pete as a complex mystery unfolds around them. People living in a house they were evicted from, a death, the possible loss of Zoe's home? Everything combines into a whirlwind mystery that keeps you guessing about which possible suspect could be the worst one of the bunch. I loved the commentary on the people who move out of the city to "enjoy" country life and then build fortresses and complain about the noises involved Good third in the Zoe Chambers series.Things get complicated between Zoe and Pete as a complex mystery unfolds around them. People living in a house they were evicted from, a death, the possible loss of Zoe's home? Everything combines into a whirlwind mystery that keeps you guessing about which possible suspect could be the worst one of the bunch. I loved the commentary on the people who move out of the city to "enjoy" country life and then build fortresses and complain about the noises involved in country life! A fast moving action cozy mystery and romance set in rural Pennsylvania. I the story moves along and will keep your attention and the characters are well developed. Zoe is a paramedic and responses to accidents. She lives on a farm and has two cats and horse. While Pete is the Police chief of the town. and investigates the accidents. Pete is mediating a domestic dispute over the height of the hedges and an explosion is heard. Both Zoe and Pete arrive at the area and find a house has exploded. Zoe A fast moving action cozy mystery and romance set in rural Pennsylvania. I the story moves along and will keep your attention and the characters are well developed. Zoe is a paramedic and responses to accidents. She lives on a farm and has two cats and horse. While Pete is the Police chief of the town. and investigates the accidents. Pete is mediating a domestic dispute over the height of the hedges and an explosion is heard. Both Zoe and Pete arrive at the area and find a house has exploded. Zoe and Pete disagreed over who cause the explosion as Zoe has invited the owner and 8 year old daughter to live at her home. Pete feels she has invited a killer into her home. Zoe must fine the answers before she loses everything dead to her. A fast paced, fun, entertaining read that really had me guessing who was the killer until close to the very end. As usual another Henery Press publication did not fail to entertain. And Annette Dashofy does not fail In her third in the series of Zoe Chambers, a paramedic who is really wanting to be a CSI expert. I highly recommend this, as well as, her other books. Thank you Henery Press and Net Galley for providing me with this free e-galley in exchange for an honest review. Once again, I was privileged to read an advanced copy of this book. A stellar third installment. The plot revs up fast and stays revved until the last page. I admire Dashofy for taking Zoe right to the edge - and perhaps dropping her off it, depending on your perspective. Facing a lot of loss, you see right into Zoe's heart. And for those of you waiting for the Zoe/Pete relationship to settle itself, well, I can only say this book will not disappoint in that area, either. I usally like this series slightly more than this - but here Zoe is too close to the too stupid to live/foolhardy/willfully blind line for me. I like the mystery and continue to like the characters, but thought that this was needlessly manufacturing some of the conflict between Pete and Zoe. This is a great little mystery series. The characters are believable (though like any series you have to suspend belief that this much tragedy and mayhem could hit one town and character). My favorite thing is that the relationship between the two main characters is progressing slowly and with a few hitches, but it is moving along. Too many series don’t allow the characters to grow, change and develop. The mystery keeps you guessing until nearly the end, and there is plenty of suspense. Seriously, every book gets better. I had to force myself to put the book down. Even though I knew the culprit very early on, the authorities wavering was so realistic, based on what they knew and didn't know at any given time. Zoe & Pete--all the characters--are amazing. Everything is strong writing-wise, and there aren't even any grammatical errors (thank the grammar gods). I cannot recommend this series highly enough. I know have two people on my must buy list. 2 1/2 Stars: The previous book I read was expertly crafted. Unfortunately, this colored my experience of this novel. Bridges Burned was just an okay mystery. Often, the writing was melodramatic or left big holes. The characters were mostly likable but their actions bordered on unbelievable. I couldn’t reckon with the histrionics of Pete and Zoe. Skips in logic left the overall story limping along. Just a so-so book. I do enjoy Zoe Chambers Mysteries, there times I don't want to keep reading the story, I don't want to know what happens, and Bridges Burned was no different, I enjoyed this book all the way to the end, I am reading them from 1 to 5, but a person won't have too. They are fast read and they keep you guessing. The mystery was pretty good, although the main villain was obvious from the get-go. The romance was pretty lame. I get that the author wanted to keep the tension going, but I find their extreme ups and downs pretty unrealistic. Excellent writing. Couldn't put it down. It keeps you guessing until the end. I feel that the characters are people I have known. Well put together mystery with a frustrating relationship in the background. Hard to put down! Another great read in the Zoe Chambers series. Once started it was hard to put down. Can’t wait to read the next one! I love really getting into a book, and when I don't want it to end, that is a 5 star rating for me. Exciting story that always keeps the reader guessing. Zoe Chambers at her best. A must read if you are enjoying this series. Another great addition to this series. I thoroughly enjoy all the characters and look forward to many more in this series. The action starts from the very beginning of Bridges Burned. When Zoe keeps a young man from going into a burning building to try and save his wife, which Zoe is impossible. She saves his life and seeing his grief, she asks him and his young son to stay at her farm while he pulls his life together and finds a permanent place for himself and his son. Chief of Police Pete Adams is not happy with Zoe's houseguests. He suspects that Holt Farabee may be responsible for not just one, but two deaths. When Zoe ignores his warning and the strain on their relationship may be too much to overcome. Fast paced with characters that are well rounded, the Zoe Chamber's series is one that will put Annette Dashofy on the top of your Authors to keep list. You will be returning to Vance Township to visit with your friends there. Bridges Burned is a definite 5 out of 5. The first book in this series was very good though it went a few places that I was uncomfortable with. The second book was wonderful! The plot line was good, the characters were real, the mystery was puzzling, the whole things was just the kind of contemporary mystery I love. I was really look forward to this one. Once again the plot was good and the mystery was well-crafted but the characters! I wanted to slap them over and over and really, I don't think Zoe acted like herself at all. I hope th The first book in this series was very good though it went a few places that I was uncomfortable with. The second book was wonderful! The plot line was good, the characters were real, the mystery was puzzling, the whole things was just the kind of contemporary mystery I love. I was really look forward to this one. Once again the plot was good and the mystery was well-crafted but the characters! I wanted to slap them over and over and really, I don't think Zoe acted like herself at all. I hope the fourth book in this series will return her to her right mind and I will be impatiently waiting for it. Zoe and Pete sure looked like they were getting together at the end of the last book and this one starts with them seeing where that's going to go. They get a call to a house that has had a gas explosion and have to stop the husband from running back into the house as it burns to rescue his wife who dies in the explosion. He has a 10 year old daughter, Maddie, and Zoe can feel Maddie's pain, having lost her father at a young age and suggests that the dad and daughter move in with her at her farm. Obviously, Pete isn't going to like this since the dad is a murder suspect. Zoe has so many TSTL moments that I was wondering if it was the same character from the previous book. Much angst results from Zoe and Pete's differences over the suspect. The mystery had nice twists and turns. The characters except for Pete and Zoe moments of idiocy were superb. I love the style of writing. Please just pass on the romantic angst next time and I'll be a happy camper. Book provided by Netgalley but I always give my honest opinion. Bridges Burned, by Annette Dashofy, is the third book in her Zoe Chambers Mysteries series, and the best one yet! The writing is first-rate. with many twists and turns in the plot. I couldn't put it down, and finished it in one day. Bridges Burned is a real page-turner! The action in Bridges Burned moves quickly, from the explosive beginning to the climactic ending. I love the ending! I can't wait to read the next book! The events are told from the alternating points of view of the main character Bridges Burned, by Annette Dashofy, is the third book in her Zoe Chambers Mysteries series, and the best one yet! The writing is first-rate. with many twists and turns in the plot. I couldn't put it down, and finished it in one day. Bridges Burned is a real page-turner! The events are told from the alternating points of view of the main characters Pete Adams and Zoe Chambers. Pete and Zoe are my favorite characters — both seem real and very likable. They have been best friends for years, but now their friendship seems to be evolving.... Into romance? READ THE BOOK to find out. All of the secondary characters that I remember from the previous Zoe Chambers books are back. A few are just mentioned by other characters as being elsewhere, in the hospital or out west on vacation, but most have returned "in person." Sylvia Bassi and Mrs Kroll are my favorites among the returning secondary characters. Sylvia, especially, has some great lines in Bridges Burned. If she were real, I think I would really enjoy being friends with Sylvia. Bridges Burned by Annette Dashofy is a fantastic book that has earned my top rating of Five Stars! I absolutely LOVE this book, and recommend Bridges Burned and the Zoe Chambers Mysteries to all Mystery fans. Note: I received a complimentary copy of Bridges Burned, and voluntarily reviewed it. This is the third book in a series by Annette Dashofy. I started reading the series on book two, Lost Legacy. I tend to read series out of order, and if I can keep it all straight, I know the author is doing a great job of relaying info from other books into the new book. Dashofy is doing a fantastic job. Every Zoe Chambers mystery is like being on an adrenaline rush. Dashofy weaves a complex mystery that you think you have it all figured out... and then you don't. I love authors who can surpris This is the third book in a series by Annette Dashofy. I started reading the series on book two, Lost Legacy. I tend to read series out of order, and if I can keep it all straight, I know the author is doing a great job of relaying info from other books into the new book. Dashofy is doing a fantastic job. Every Zoe Chambers mystery is like being on an adrenaline rush. Dashofy weaves a complex mystery that you think you have it all figured out... and then you don't. I love authors who can surprise me with who really dun it. Zoe is a paramedic and her love interest is Pete, he is the Sheriff. The two are a couple but they can never seem to get together for longer than half a dinner before some other emergency unfolds that requires their attention. As the end of the book neared, I was really concerned about the future for my favorite mystery couple. I won't tell you how it came out but it really had me biting my fingernails. This is a wonderful read and anyone would enjoy it. Check it out if you can. Just a fab complex mystery with a dash of romance. I received this as an ARC (Advanced Reader Copy) from Net Galley, in return for an honest review. I thank Net Galley, the publisher and the author for allowing me to read this title. USA Today bestselling author Annette Dashofy has spent her entire life in rural Pennsylvania surrounded by cattle and horses. When she wasn’t roaming the family’s farm or playing in the barn, she could be found reading or writing. After high school, she spent five years as an EMT on the local ambulance service, dealing with everything from drunks passing out on the sidewalk to mangled bodies in ca USA Today bestselling author Annette Dashofy has spent her entire life in rural Pennsylvania surrounded by cattle and horses. When she wasn’t roaming the family’s farm or playing in the barn, she could be found reading or writing. After high school, she spent five years as an EMT on the local ambulance service, dealing with everything from drunks passing out on the sidewalk to mangled bodies in car accidents. These days, she, her husband, and their spoiled cat, Kensi, live on property that was once part of her grandfather’s dairy. Her Zoe Chambers mystery series includes three Agatha Award finalists. Her latest release, CRY WOLF came out September 2018.